Traditional in style and casual in feeling, the Nymphea is a perfect choice for those who enjoy a relaxed atmosphere and memorable sightseeing. Nymphea’s charming decor is country cottage-inspired, featuring rich wood paneling, delicate stained glass, and cheerfully patterned florals. Built-in sofas line the salon for comfortable socializing, while freshly made canapes and glasses of wine are savored on the deck. Cozy cabins offer adequate space. The service oriented crew is enthusiastic to introduce guests to the delights of this exquisite region, and more active guests can explore the trails along the river by foot or by bicycle. Classic French cuisine is crafted from seasonal ingredients, with wine pairings selected from many local vineyards. Of course, the highlight of Nymphea’s sightseeing is the Loire Valley’s many majestic and iconic chateaux. Famed, enchanting, and magnificent: the roll call includes Chenonceau, Amboise, Villandry, Valency, and Foulques Nerra. 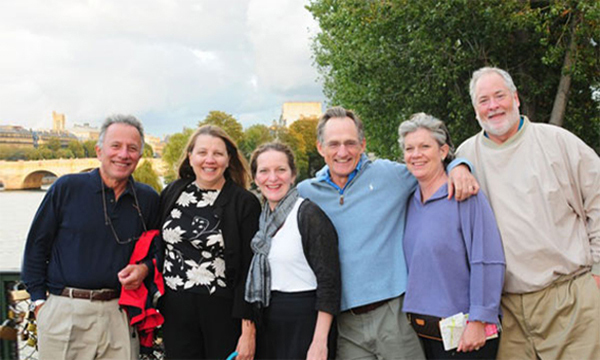 Visits to working wineries, rambling gardens, and lively markets further augment the vivid cultural explorations. In the afternoon, you will be met at the St Pierre des Corps Train Station by Nymphea crew. From here, relax as you are chauffeured to the barge, moored nearby in the petite village of Moulin de Nitray. A traditional champagne welcome and introduction to the crew awaits you, before your first of many gourmet dinners aboard. A morning cruise through two locks takes us to the quaint town of Larcay, mooring under the weeping willows. Relax on deck and admire the scenery slipping by. Your Tour Guide escorts you on an afternoon excursion to Chateau de Villandry, with its world-renowned renaissance gardens. Return to the barge for dinner and drinks aboard. After a morning cruise past no less than six private chateaux, we tie up opposite the hamlet of Vallet, a cluster of classic Tourangeau architecture grouped around its 18th century mill. Laze on deck and watch the scenery go by. This afternoon’s excursion is to Amboise on the banks of the Loire, for visits to the Royal Chateau D'Amboise and the Clos Luce, Leonardo Da Vinci's home. Back onboard, Chef is crafting another gourmet dinner. 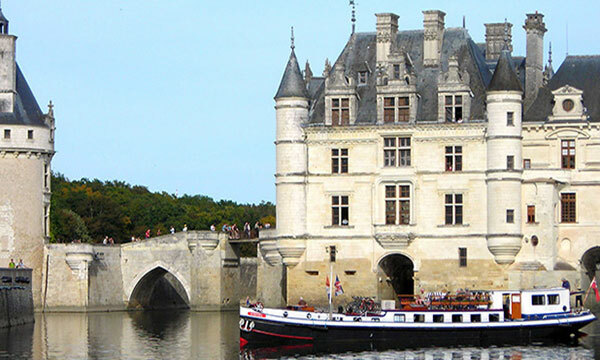 Cruise right under the Chateau de Chenonceau! 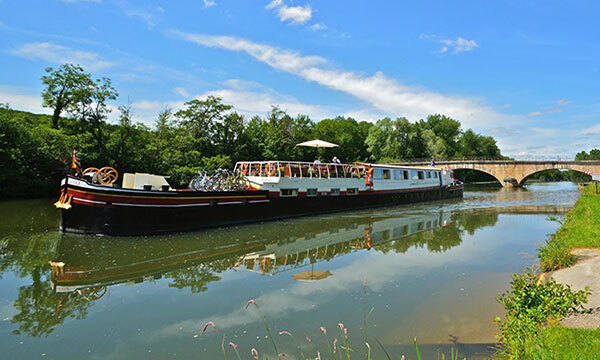 A morning cruise may include a stop at the tiny landing stage next to Domaine de Fontenay. A two-minute walk brings you to their courtyard for a tasting of their range of Touraine wines as an aperitif before lunch moored at Blere. In the afternoon, cruise under the 5- arch bridge of the impressive Chateau de Chenonceau and moor at Chisseaux. From here, your Tour Guide accompanies you on a guided visit at the Chateau. Tonight’s dinner is ashore at a local bistro. Relax on deck during a morning cruise. This afternoon’s excursion is to Valencay, one of the Loire's most splendid chateaux and the home of Napoleon's foreign minister, Talleyrand. Once back onboard, cruise to the next lock and disembark or a visit to one of the area's more unusual dwellings, La Magnaneraie. The Coquillat family have grown up in this hillside troglodyte habitation, which has been in turn wine cellar, quarry for the tuffeau stone, and lastly a silkworm nursery. Return to the barge for a late evening cruise and dinner aboard. 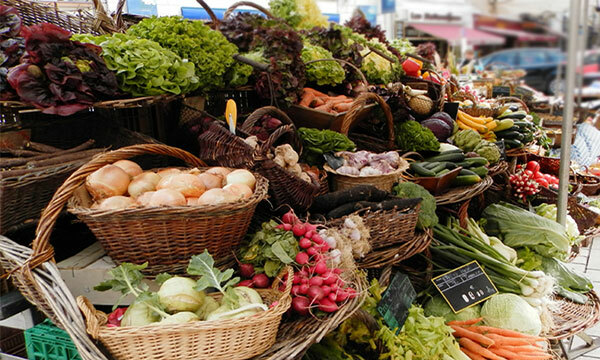 This morning, a short stroll takes us into one of the largest weekly street markets in Touraine. There is much to explore at the 12th Century Chateau of Foulques Nerra, overlooking the medieval town square. Visit the local vineyard of the Meriau family, to taste the vintages of Touraine. Back onboard, an afternoon cruise passes under Chenonceau once again and arrives at the hamlet of Nitray in time to visit the Chateau and its rose garden. 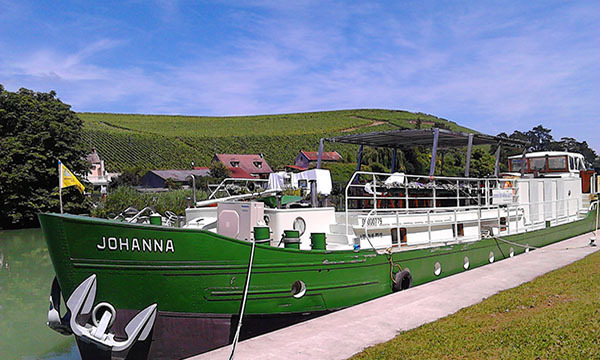 Enjoy an aperitif from their vineyards before returning to the barge for the Captain's Farewell Dinner. After breakfast, you will be chauffeured to the St. Pierre des Corps Train Station.